Nestled slightly beneath street level in the historic Beaux-Arts style James Reed Building, known to Pittsburghers and travelers today as Hotel Monaco, sits The Commoner. 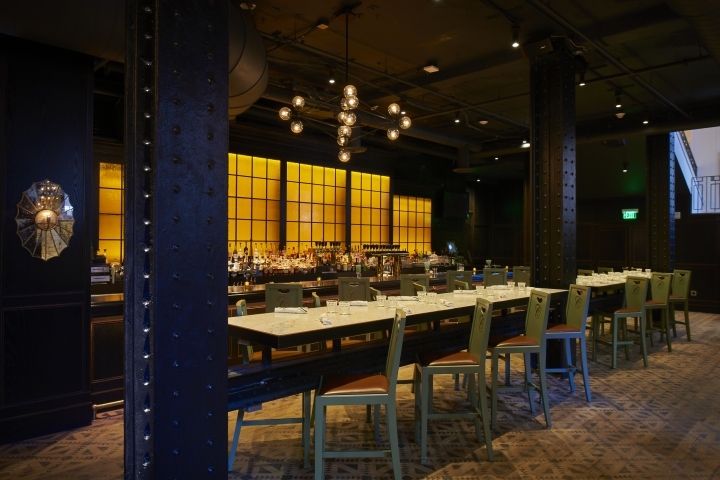 Neatly contrasting the above-ground features of Hotel Monaco, with its white walls and eccentric brightly-colored decor, this subterranean gastropub features an elegant, post-industrial-feel with exposed steel beams, open kitchen and wood-fired oven. The extensively stocked bar, “uncommon” twists on classic fare, and fresh cuts of meats and fish attract hotel guests and locals alike. Aside from the atmosphere and food, The Commoner has a Silver designation with the Sustainable Pittsburgh Restaurant Program, showing its commitment to supporting Pittsburgh’s vibrant communities and healthy environment. Named for “The Great Commoner,” Pittsburgh’s own namesake William Pitt himself, The Commoner is a sensory and culinary experience “for kings and commoners” alike. The bar offers elegantly presented, house-designed cocktails, as well as a beyond-extensive wine, spirits and craft beer list. Their claim to fame is their whiskey selection, and with more than 100 types of bourbon, rye, whiskey, and scotch in stock, they undoubtedly have an option that suits your tastes. But with more than 60 types of wine, and dozens of types of vodka, rum, gin, tequila and mezcal, brandy, and after dinner drinks available, the knowledgeable bartenders will be able to mix, pour, or open you the drink that your heart desires. The dinner, lunch and brunch menus are as interesting and diverse as the bar. The dinner menu offers gourmet snacks and bar bites, spiced-up takes on classic American tavern food making use of fresh seasonal ingredients, and high- quality cuts of meat and fish. Lunch brings unique sandwiches, burgers and seasonal salads, along with savory snacks and soups. And the breakfast and brunch menus have everything from gourmet takes on classics like steak and eggs and eggs benedict to mouth-watering brisket hash and chicken and waffles. Since 2017, The Commoner has been recognized as a designated Sustainable Pittsburgh Restaurant, thanks to its numerous sustainable practices. Among the highlights, they train all employees on waste reduction practices and chefs utilize nose-to-tail cooking techniques with whole pigs, lambs, and chickens. The restaurant is outfitted with T5 and LED lighting to save on energy use, and they prioritize buying meat and produce from local sources like Primrose Farms, and Penn’s Corner Farm Alliance. To read The Commoner’s full sustainability report, check out their self-assessment in their Sustainable Pittsburgh Restaurant profile. Whether you’re hungry for a decadent bite, thirsty for a creative drink, or just intrigued to check out one of Pittsburgh’s most interesting culinary spots, The Commoner will have something to satisfy your desires. Stop by seven days a week, Monday through Thursday from breakfast time until midnight, Friday and Saturday from breakfast until 2am, and Sundays from breakfast until 11pm. Depending on the day and time, you may want to consider getting a reservation for dinner.